At AccessNsite, “next generation” is more than a buzzword. To stay ahead of rapid technological change and increasing cyber threats, we are unrelenting in the evolution and enhancement of our software and hardware products. Below you can view our most recent updates. AccessNsite Windows Installer – The new AccessNsite Windows installer automates the installation of AccessNsite for new installations and can also be used to upgrade an existing installation to a new version. The utility can install a MariaDB database or point to an existing installation of a SQL Server database. For Web Client installations, Apache Tomcat can be automatically installed and configured. JSON Web Services API Additions – This version extends the functionality of the JSON API. ODBC Data Import – AccessNsite’s new Data Transfer driver is used to provide and manage the transfer of personnel, credential, and access privilege data. The ability to import data from an ODBC data source has been added to the Data Transfer driver’s capabilities. Mercury Series 3 Serial I/O Boards – Mercury Security has released the latest version of their serial I/O boards (MR50, MR52, MR16IN, MR16OUT). With this release, AccessNsite now fully supports the Series 3 boards. Schedules Module Improvements – You now have the option to show the type of schedule and the days and times that the schedule is active without having to edit the schedule you are interested in. IN120 Hard Powered Wireless Lock – Assa Abloy provides an option for powering their IN120 wireless lock using a hard-wired connection instead of using batteries, thus making it an online lock. This new model definition has been added into AccessNsite. Created New JSON Web Services API – This provides an easier and more widely used interface to the AccessNsite API. LDAP Data Transfer – AccessNsite has created a new Data Transfer driver that will be used to provide and manage the transfer of personnel, credential, and access privilege data. The first data interface that is being provided is to the Lightweight Directory Access Protocol (LDAP) which can be used to interface with Microsoft’s Active Directory. Mercury LP1501 and LP4502 Controller – The LP Series controllers are Mercury’s next generation of intelligent controllers that run embedded Linux. The LP1501 and LP4502 controller boards can now be used with AccessNsite. Von Duprin RU/RM – AccessNsite now supports the Von Duprin Remote Undogging (RU) and Remote Monitoring (RM) options available with its 98/99 and 33A/35A series devices. These options are supported through either an IP or RSI connection to the Allegion Engage Gateway. Allegion CTE – Integration with the Allegion CTE has been added. The CTE is an Engage enabled single opening controller that allows perimeter and common area openings to be managed in a single system along with Schlage Control smart deadbolts, NDE cylindrical and LE mortise wireless locks. The CTE provides wireless control of door openings involving a standard lock (electric strike, electrified panic device, etc. ), door position switch, request to exit, and specific Schlage readers (MT11-485 and MT15-485). 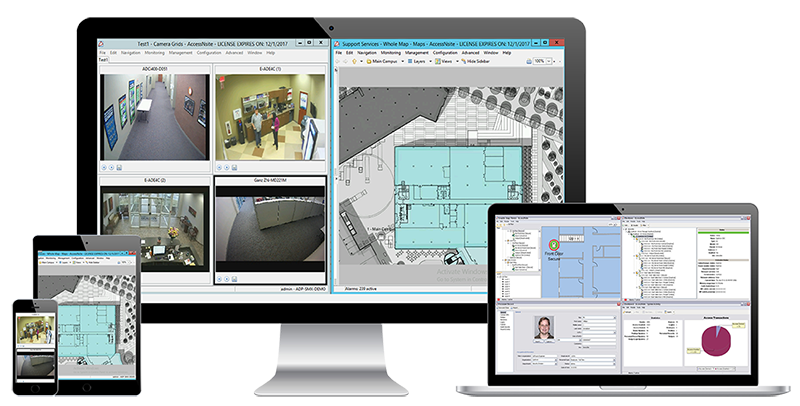 ExacqVision 9.x – Support for ExacqVision has been updated to include version 9.x. Multiple Mercury Drivers – AccessNsite now supports up to ten Mercury drivers. This feature was added to increase performance for installations with many controllers. Optimally it is recommended to run up to 50 controllers per driver to distribute the load among multiple drivers. The elevator user interfaces with a kiosk and, when access rights have been validated through AccessNsite, the user is directed to a specific elevator cab. The system is able to group passengers and stops, making it more efficient than traditional elevator systems. Within the AccessNsite application, the user can configure intercom hardware, determine intercom status, initiate a call from one intercom device to another, and control the output on an intercom device. Mercury LP Series Controllers – The LP Series controllers (LP2500, LP1502, LP1501) are Mercury’s next generation of intelligent controllers that run embedded Linux. These new controller boards can now be used with AccessNsite. AccessNsite now integrates with users to interface with Allegion Schlage NDE and LE wireless locksets via Wi-Fi mode. With AccessNsite’s NDE and LE Wi-Fi integration, users can utilize pre-existing Wi-Fi to communicate with the locksets without needing to use an ENGAGE Gateway device, making installation easier and operation more efficient. Users also still have the option to use the existing functionality of interfacing via an ENGAGE Gateway, either directly over Ethernet or indirectly via a Mercury controller. Schlage NDE and Control – AccessNsite now integrates with the new Schlage NDE series wireless lock and Control (BE 467) smart deadbolt. This integration is accomplished using a driver specifically written to interface with the locks using a wireless gateway device that is configured to use a standard Ethernet connection. Best Wi-Q – AccessNsite now integrates with the new Best Wi-Q series locks. Support for Assa Abloy DSR 7 – AccessNsite now supports version 7 of the Assa Abloy Door Service Router (DSR). Additionally, a number of new features, such as auto-discovery, are now supported, making AccessNsite fully certified. Assa Abloy Aperio v3 Integration – AccessNsite now supports Aperio v3 to provide faster unlock times without sacrificing battery life. This integration is accomplished using a version that is available for easy integration with Mercury hardware. BEST IDH Max Lock Integration – AccessNsite® now integrates with Best IDH Max locks. This integration brings together a robust Grade 1 lock, Authentic Mercury compatibility, and industry leading software in yet another “best of breed” method for deploying AccessNsite®. BEST “Shelter” Lockdown Solution – AccessNsite® now integrates with the BEST “Shelter” lockdown solution. Shelter is a set of code-compliant hardware and proven technology that can be custom-tailored for various lockdown response scenarios. Assa Abloy IN120 (WiFi) and IN220 (PoE) Lock Integration – AccessNsite® now integrates with Assa Abloy’s IN120/220 intelligent locks. Duplicate Card Numbers Allowed – In modern times it is not uncommon for access control systems to need to handle multiple card populations within one system. Credential technology decisions, company acquisitions, and other factors present a unique challenge. AccessNsite® meets that challenge by providing a new method of accepting multiple card populations where the credential numbers are the same, without significant complication to the user. Increased Max Card Formats – The maximum number of card formats that can be defined per controller has been increased from 8 to 16. Unlock Schedules On Access Points – Define a schedule directly on an access point for changing its mode (Disabled, Unlocked, Locked, Facility Code Only, Card Only, PIN Only, Card & PIN, Card or PIN). LifeSafety Power Hardware Wizard – For previously purchased LifeSafety Power enclosure kits, now select the kit from within our hardware wizard to automatically build the hardware tree to match the configuration of the kit. This makes commissioning a system faster, with minimal manual data entry. Web Client Photo Capture – Photos can now be captured into a personnel record from the Web Client using a webcam. Web Client Badge Printing – Badges can be printed to a badge printer from the Web Client. March VMS Integration – A tight integration has been written to the March Networks Video Management Software (VMS). This integration applies to the Command Lite, Command Professional, and Command Enterprise versions. It allows demand monitoring of video from a hardware tree or map, or continuous viewing from a camera grid and provides for video pop-up on event or alarm with pre- and post-event clips. Event Streaming – Now with the ability to output event data in real time to other systems, this feature allows event and alarm data to be routed to other software systems, which could include critical items such as alarms, or simple information such as usage data. Powerful filters can reduce the total data possible to only what is needed.